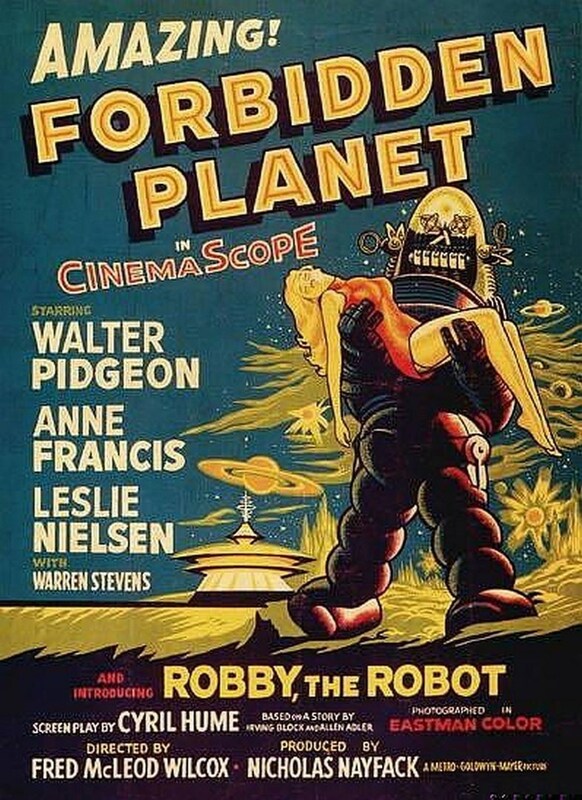 I’ve recently watched the classic 1956 American science fiction film Forbidden Planet again. It stars Walter Pidgeon, Anne Francis and Leslie Nielsen and is considered one of the greatest science fiction films of the 1950s which ultimatley inspired many modern Science fiction stories. The characters and isolated setting are similar to those in William Shakespeare’s The Tempest. It takes place In the 23rd century, where the starship C-57D reaches the distant world Altair IV to determine the fate of an Earth expedition sent there 20 years earlier. Dr. Edward Morbius, one of the expedition’s scientists, unsuccessfully tries to persuade the relief ship not to land, saying he cannot guarantee their safety. Commander John J. Adams, Lieutenant Jerry Farman, and Lieutenant “Doc” Ostrow are met by Robby the Robot, who transports them to Morbius’ residence. Morbius describes how one by one the rest of the expedition was killed by an unknown planetary force that vaporized their starship, the Bellerophon, as the last survivors tried to lift off. Only Morbius, his wife (who later died of natural causes), and their daughter Altaira were somehow immune. Morbius offers to help them prepare for the return journey, but Adams says he must await further instructions from Earth. However That night, an invisible intruder sabotages equipment aboard the starship. Adams and Ostrow confront Morbius the following morning wanting answers. Later Adams and Altaira are also attacked by a tiger, which had previously been tame in Altaira’s presence, Adams disintegrates the animal. Adams and Ostrow then learn Morbius has been studying the Krell, a highly advanced native race that perished overnight 200,000 years before. In a Krell laboratory Morbius shows them a “plastic educator”, a device capable of measuring and enhancing intellectual capacity. Morbius then takes them on a tour of a vast, 20 miles square, Krell underground machine complex, still functioning and powered by 9,200 thermonuclear reactors. To prevent further sabotage, Adams orders a force field fence deployed around the starship. However It proves ineffective when the intruder returns and murders Chief Engineer Quinn. Morbius warns Adams that he has had a premonition of further deadly attacks, similar to what happened with the Bellerophon. That night, the invisible creature returns But the ship’s weapons have no effect, and it kills Farman and two others. Morbius, asleep in the Krell lab, is startled awake by screams from Altaira. Later, while Adams tries to persuade Altaira to leave, Ostrow sneaks away to use the Krell educator. Ostrow explains to Adams that the underground machine was built to materialize anything the Krell could imagine. He says that the Krell forgot one thing: “Monsters from the Id”. Adams asserts that Morbius’ subconscious mind created the creature that killed the members of the original expedition and attacked his crew; however Morbius refuses to accept this accusation. Altaira then tells Morbius that she intends to leave with Adams and the creature reappears so Morbius commands the robot to kill it, however Robby knows the creature is a manifestation of Morbius and is unable to kill it (thanks to Asimov’s first Law of Robotics). So Adams, Altaira, and Morbius take refuge in the Krell Laboratory but the seemingly unstoppable rampaging monster pursues them until Morbius finally accepts the truth and confronts the creature himself…. Black Country day occurs annually on 14 July. The Black Country is a region of the West Midlands in England, west of Birmingham and commonly refers to all or part of the four boroughs of Dudley, Sandwell, Walsall and Wolverhampton. During the Industrial Revolution, this area became one of the most industrialised parts of Britain with coal mines, coking, iron foundries, glass factories, brickworks and steel mills producing a high level of air pollution and consequently it became referred to as the Black Country. The first trace of “The Black Country” as an expression dates from the 1840s. The name is believed to come from the soot from the heavy industries that covered the area, although the 30-foot-thick coal seam close to the surface is another possible origin. 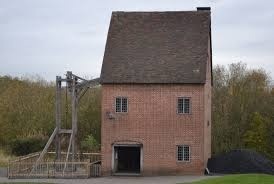 Coal mining was carried out for several centuries in the Black Country, starting from medieval times, and metalworking was important in the Black Country area as early as the 16th century spurred on by the presence of iron ore and coal in a seam 30 feet (9 m) thick, the thickest seam in Great Britain, which outcropped in various places. Many people had an agricultural smallholding and supplemented their income by working as nailers or smiths, an example of a phenomenon known to economic historians as proto-industrialisation and by the 1620s “Within ten miles [16 km] of Dudley Castle there were 20,000 smiths of all sorts”. In 1642 at the start of the Civil War, Charles I failed to capture the two arsenals of Portsmouth and Hull. So he had swords, pikes, guns, and shot manufactured in the Black Country including shot from Stourbridge, cannons from Dudley and sword blades and pike heads from Numerous small forges situated in the north of Worcestershire. However one of best sword makers of the day, Robert Porter, who manufactured swords in Digbeth, Birmingham, refused to supply swords to King Charles. Among their supporters The Royalists hadColonel Dud Dudley, who had invented a means of smelting iron by the use of coke, and who claimed he could turn out “all sorts of bar iron fit for making of muskets, carbines, and iron for great bolts”, both more cheaply, more speedily and more excellent than could be done in any other way. 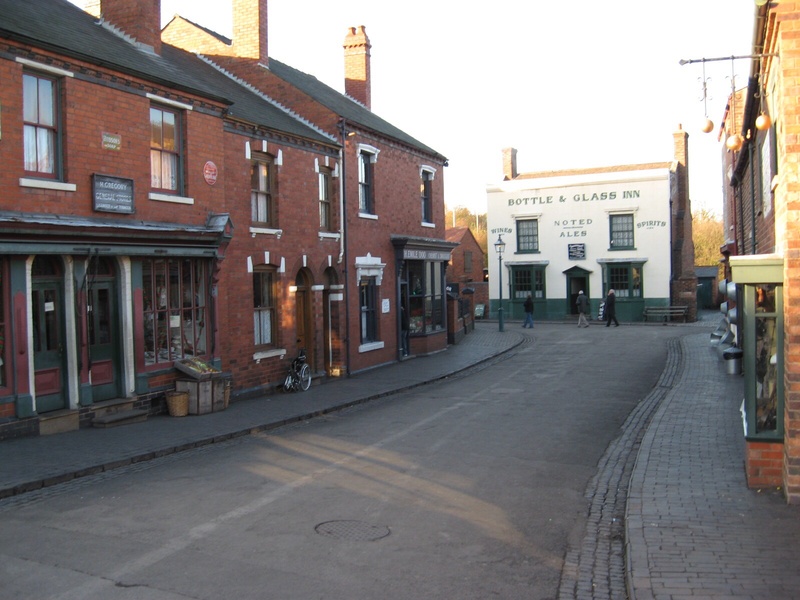 By 1785 The 14-mile (23 km) road between Wolverhampton and Birmingham was described as “one continuous town” and during the 19th century or early 20th century, many villages had their characteristic manufacture, but earlier occupations were less concentrated. Some of these concentrations are less ancient than sometimes supposed. For example, chain making in Cradley Heath seems only to have begun in about the 1820s, The anchors and chains for the ill-fated liner RMS Titanic were also manufactured in the Black Country in the area of Netherton. Three anchors and accompanying chains were manufactured; and the set weighed in at 100 tons. The centre anchor alone weighed 12 tons and was pulled through Netherton on its journey to the ship by 20 Shire horses. Canals were of crucial importance in the development of Black Country industry. Prior to the Industrial Revolution, coal and limestone were worked only on a modest scale for local consumption, but during the Industrial Revolution by the opening of canals, such as the Birmingham Canal Navigations, Stourbridge Canal and the Dudley Canal (the Dudley Canal Line No 1 and the Dudley Tunnel) opened up the mineral wealth of the area to exploitation. 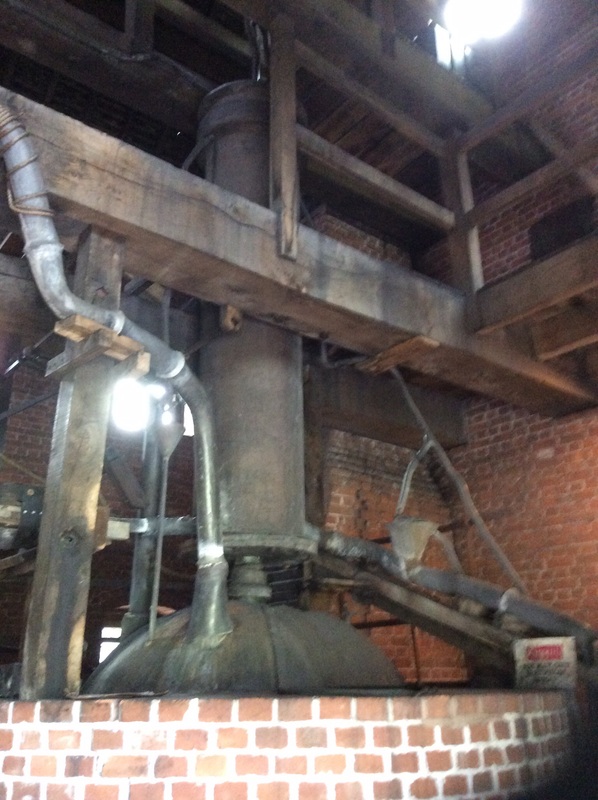 Advances in the use of coke for the production in iron enabled iron production (hitherto limited by the supply of charcoal) to expand rapidly. Glass cones where glass was made and worked were also a common sight in Dudley and Stourbridge. In 1913, the Black Country was the location of arguably one of the most important strikes in British trade union history when the workers employed in the area’s steel tube trade came out for two months in a successful demand for a 23 shilling minimum weekly wage for unskilled workers, giving them pay parity with their counterparts in nearby Birmingham. This action commenced on 9 May in Wednesbury, at the Old Patent tube works of John Russell & Co. Ltd., and within weeks upwards of 40,000 workers across the Black Country had joined the dispute. Notable figures in the labour movement, including a key proponent of Syndicalism, Tom Mann, visited the area to support the workers and Jack Beard and Julia Varley of the Workers’ Union were active in organising the strike. During this confrontation with employers represented by the Midlands Employers’ Federation, a body founded by Dudley Docker, the Asquith Government’s armaments programme was jeopardised, especially its procurement of naval equipment and other industrial essentials such as steel tubing, nuts and bolts, destroyer parts, etc. This was of national significance at a time when Britain and Germany were engaged in the Anglo-German naval arms race that preceded the outbreak of the First World War. Following a ballot of the union membership, a settlement of the dispute was reached on 11 July after arbitration by government officials from the Board of Trade led by the Chief Industrial Commissioner Sir George Askwith, 1st Baron Askwith. One of the important consequences of the strike was the growth of organised labour across the Black Country, which was notable because until this point the area’s workforce had effectively eschewed trade unionism. The area also gained widespread notoriety for its hellish appearance. Charles Dickens’s novel The Old Curiosity Shop, written in 1841, described how the area’s local factory chimneys “Poured out their plague of smoke, obscured the light, and made foul the melancholy air”. In 1862, Elihu Burritt, the American Consul in Birmingham, described the region as “black by day and red by night”, because of the smoke and grime generated by the intense manufacturing activity and the glow from furnaces at night. Early 20th century representations of the region Feature in the Mercian novels of Francis Brett Young, such as My Brother Jonathan (1928). Carol Thompson the curator “The Making of Mordor” at Wolverhampton Art Gallery in the last quarter of 2014 stated that J. R. R. Tolkien’s description of the grim region of Mordor “resonates strongly with contemporary accounts of the Black Country”, in The Lord of the Rings. in the Elvish Sindarin language, Mor-Dor means Dark (or Black) Land. The character of Bilbo Baggins may have been based on Tolkien’s observation of Mayor Ben Bilboe of Bilston in The Black Country, who was a Communist and Labour Party member from the Lunt in Bilston. The 20th century saw a decline in coal mining in the Black Country, with the last colliery in the region – Baggeridge Colliery near Sedgley – closing on 2 March 1968, marking the end of an era after some 300 years of mass coal mining in the region, though a small number of open cast mines remained in use for a few years afterwards. Until the late twentieth century, the Black Country had no officially defined borders.Some traditionalists have tended to define it as “the area where the coal seam comes to the surface – so West Bromwich, Oldbury, Blackheath, Cradley Heath, Old Hill, Bilston, Dudley, Tipton, Wednesfield and parts of Halesowen, Wednesbury and Walsall but not Wolverhampton, Stourbridge and Smethwick or what used to be known as Warley”.Others have included areas which were associated with heavy industry. Today the Black Country commonly Includes the majority or all of the four boroughs of Dudley, Sandwell, Walsall and Wolverhampton. Official recognition of the Black Country came in 1987, when the Black Country Development Corporation was set up. In 1999 the Black Country Consortium was founded comprising the four local authorities of Dudley, Sandwell, Walsall and Wolverhampton an area of 356 square kilometres. Bastille day takes place annually on 14 July to commemorate the storming of the Bastille prison in Paris on 14 July 1789. The Bastille was a fortress in Paris, known formally as the Bastille Saint-Antoine. It played an important role in the internal conflicts of France and for most of its history was used as a state prison by the kings of France. The Bastille was built to defend the eastern approach to the city of Paris from the English threat in the Hundred Years’ War. Initial work began in 1357, but the main construction occurred from 1370 onwards, creating a strong fortress with eight towers that protected the strategic gateway of the Porte Saint-Antoine on the eastern edge of Paris. 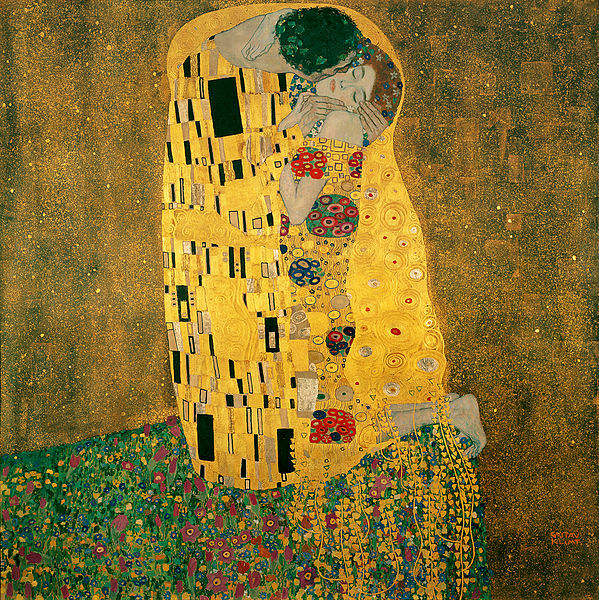 The innovative design proved influential in both France and England and was widely copied. The Bastille figured prominently in France’s domestic conflicts, including the fighting between the rival factions of the Burgundians and the Armagnacs in the 15th century, and the Wars of Religion in the 16th. The fortress was declared a state prison in 1417; this role was expanded first under the English occupiers of the 1420s and 1430s, and then under Louis XI in the 1460s. The defences of the Bastille were fortified in response to the English and Imperial threat during the 1550s, with a bastion constructed to the east of the fortress. The Bastille played a key role in the rebellion of the Fronde and the battle of the faubourg Saint-Antoine, which was fought beneath its walls in 1652. Louis XIV used the Bastille as a prison for upper-class members of French society who had opposed or angered him including, after the revocation of the Edict of Nantes, French Protestants. From 1659 onwards, the Bastille functioned primarily as a state penitentiary; by 1789, 5,279 prisoners had passed through its gates. Under Louis XV and XVI, the Bastille was used to detain prisoners from more varied backgrounds, and to support the operations of the Parisian police, especially in enforcing government censorship of the printed media. Although inmates were kept in relatively good conditions, criticism of the Bastille grew during the 18th century, fueled by autobiographies written by former prisoners. Reforms were implemented and prisoner numbers were considerably reduced. In 1789 the royal government’s financial crisis and the formation of the National Assembly gave rise to a swelling of republican sentiments among city-dwellers. On 14 July the Bastille was stormed by a revolutionary crowd, primarily residents of the faubourg Saint-Antoine who sought to commandeer the valuable gunpowder held within the fortress. Seven remaining prisoners were found and released and the Bastille’s governor, Bernard-René de Launay, was killed by the crowd. The Bastille was demolished by order of the Committee of the Hôtel de Ville. Souvenirs of the fortress were transported around France and displayed as icons of the overthrow of despotism. Over the next century, the site and historical legacy of the Bastille featured prominently in French revolutions, political protests and popular fiction, and it remained an important symbol for the French Republican movement. Almost nothing is left of the Bastille except some remains of its stone foundation that were relocated to the side of Boulevard Henri IV. Historians were critical of the Bastille in the early 19th century, and believe the fortress to have been a relatively well-administered institution, involved in French policing and political control during the 18th century The governor of the Bastille was Bernard-René de Launay, son of the previous governor and actually born within the Bastille. The Bastille had gradually become a symbol of Royal Tyranny and cost of maintaining this garrisoned medieval fortress for so limited a purpose was uneconomic and caused tension. In 1789 during the reign of Louis XVI France faced a major economic crisis, caused by the cost of intervening in the American Revolution, and exacerbated by a regressive system of taxation On 5 May 1789, the Estates-General of 1789 convened to deal with this issue, but were held back by archaic protocols and the conservatism of the Second Estate, consisting of the nobility and amounting to only 2% of France’s population at the time. On 17 June 1789, the Third Estate, with its representatives drawn from the commoners, reconstituted themselves as the National Assembly, a body whose purpose was the creation of a French constitution. The king initially opposed this development, but was forced to acknowledge the authority of the assembly, which subsequently renamed itself the National Constituent Assembly on 9 July. The commoners formed the National Guard, sporting tricolour cockades (cocardes) of blue, white and red, formed by combining the red and blue cockade of Paris and the white cockade of the king. 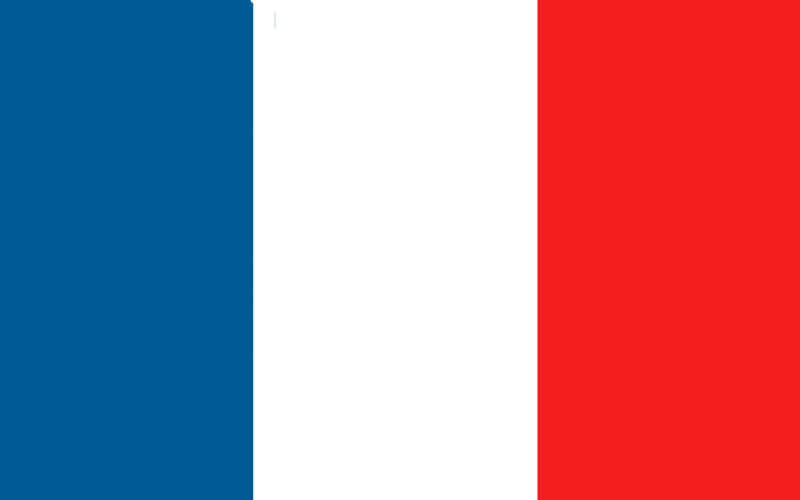 These cockades, and soon simply their colour scheme, became the symbol of the revolution and, later, of France itself. Paris, close to insurrection and, in François Mignet’s words, “intoxicated with liberty and enthusiasm”, showed wide support for the Assembly. The press published the Assembly’s debates; political debate spread beyond the Assembly itself into the public squares and halls of the capital. The Palais-Royal and its grounds became the site of an ongoing meeting The crowd, on the authority of the meeting at the Palais-Royal, broke open the prisons of the Abbaye to release some grenadiers of the French guards, reportedly imprisoned for refusing to fire on the people. The Assembly recommended the imprisoned guardsmen to the clemency of the king; they returned to prison, and received pardon. The rank and file of the regiment, previously considered reliable, now leaned toward the popular cause. On 11 July 1789, with troops at Versailles, Sèvres, the Champ de Mars, and Saint-Denis, Louis XVI, acting under the influence of the conservative nobles of his privy council, dismissed and banished his finance minister, Jacques Necker, who had been sympathetic to the Third Estate, and completely reconstructed the ministry. The marshals Victor-François, duc de Broglie, la Galissonnière, the duc de la Vauguyon, the Baron Louis de Breteuil, and the intendant Foulon, took over the posts of Puységur, Armand Marc, comte de Montmorin, La Luzerne, Saint-Priest, and Necker. The Swiss and German regiments referred to were among the foreign mercenary troops who made up a significant portion of the pre-revolutionary Royal Army, and were seen as being less likely to be sympathetic to the popular cause than ordinary French soldiers. By early July, approximately half of the 25,000 regular troops in Paris and Versailles were drawn from these foreign regiments. The French regiments included in the concentration appear to have been selected either because of the proximity of their garrisons to Paris or because their colonels were supporters of the reactionary “court party” opposed to reform. The regiment of Gardes Françaises (French Guards) formed the permanent garrison of Paris and, with many local ties, was favourably disposed towards the popular cause. This regiment had remained confined to its barracks during the initial stages of the mid-July disturbances. With Paris becoming the scene of a general riot, Charles Eugene, Prince of Lambesc (Marshal of the Camp, Proprietor of the Royal Allemand-Dragoons), not trusting the regiment to obey his order, posted sixty dragoons to station themselves before its dépôt in the Chaussée d’Antin. The officers of the French Guards made ineffectual attempts to rally their men. The rebellious citizenry had now acquired a trained military contingent. As word of this spread, the commanders of the royal forces encamped on the Champ de Mars became doubtful of the dependability of even the foreign regiments. The future “Citizen King”, Louis-Philippe, duc d’Orléans, witnessed these events as a young officer and was of the opinion that the soldiers would have obeyed orders if put to the test. He also commented in retrospect that the officers of the French Guards had neglected their responsibilities in the period before the uprising, leaving the regiment too much to the control of its non-commissioned officersHowever, the uncertain leadership of Besenval led to a virtual abdication of royal authority in central Paris. A “bourgeois militia” arose through the sixty voting districts of Paris to take control over the insurrection. A crowd gathered outside around mid-morning, calling for the surrender of the prison, the removal of the cannon and the release of the arms and gunpowder. Two representatives of the crowd outside were invited into the fortress and negotiations began, and another was admitted around noon with definite demands. The negotiations dragged on while the crowd grew and became impatient. Around 1:30, the crowd surged into the undefended outer courtyard. A small party climbed onto the roof of a building next to the gate to the inner courtyard and broke the chains on the drawbridge, crushing one vainqueur as it fell. Soldiers of the garrison called to the people to withdraw but in the noise and confusion these shouts were misinterpreted as encouragement to enter. Gunfire began, apparently spontaneously, turning the crowd into a mob. The crowd seems to have felt that they had been intentionally drawn into a trap and the fighting became more violent and intense, while attempts by deputies to organise a cease-fire were ignored by the attackers. The firing continued, and after 3 pm the attackers were reinforced by mutinous gardes françaises, along with two cannons. A substantial force of Royal Army troops encamped on the Champs de Mars did not intervene. Governor de Launay ordered a cease-fire at 5 pm. A letter offering his terms was handed out to the besiegers through a gap in the inner gate. His demands were refused, but de Launay nonetheless capitulated, as he realised that with limited food stocks and no water supply his troops could not hold out much longer. He accordingly opened the gates to the inner courtyard, and the vainqueurs swept in to liberate the fortress at 5:30. Ninety-eight attackers and one defender had died in the actual fighting, a disparity accounted for by the protection provided to the garrison by the fortress walls. De Launay was seized and dragged towards the Hôtel de Ville in a storm of abuse. Outside the Hôtel, a discussion as to his fate began. The badly beaten de Launay shouted “Enough! Let me die!” and kicked a pastry cook named Dulait in the groin. De Launay was then stabbed repeatedly and died. The Marquis de Launay, Governor of the Bastille, and of Monsieur Flesselles, Prévôt des Marchands were then beheaded en route to the Palais-Royal. Three officers of the permanent Bastille garrison were killed by the crowd and two of the invalides of the garrison were also lynched, all but two of the Swiss regulars of the Salis-Samade Regiment were protected by the French Guards and eventually released to return to their regiment. Their officer, Lieutenant Louis de Flue, wrote a detailed report on the defense of the Bastille, which was incorporated in the logbook of the Salis-Samade.